The sense of smell is perhaps the most pervasive of all senses, but it is also one of the least understood and least exploited in HCI. 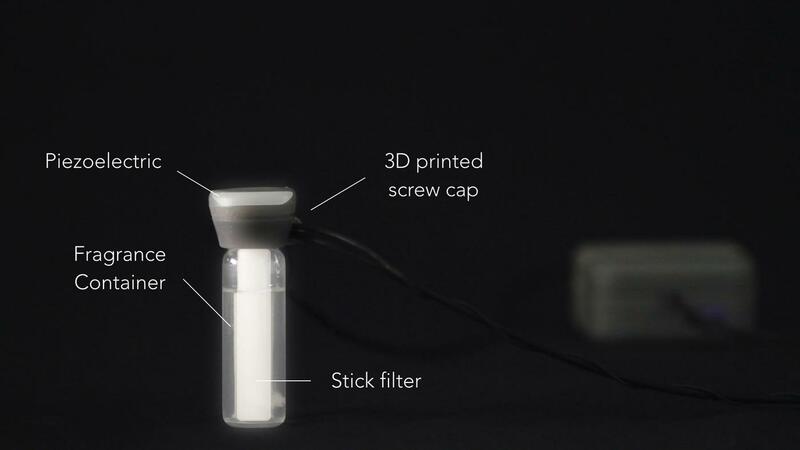 We present Essence, the first olfactory computational necklace that can be remotely controlled through a smartphone and can vary the intensity and frequency of the released scent based on biometric or contextual data. A considerable amount of effort in HCI (Human Computer Interaction) has been directed to make the user experience more seamless, natural, and integrated in our physical lives. When designing user interfaces, we aim to create tools that will enable the user to accomplish certain tasks with a minimum effort, time and difficulty. When evaluating these tools, we take into account individuals perception of the system such as utility, easy of use and efficiency. However, we tend to consider the user as a conscious thinking mind. In reality, a lot of our perception of the environment and our behavior is unconscious and does not involve deliberate rational thinking. We perceive the world indirectly by processing and interpreting the raw data from our senses and our thoughts and behavior are frequently biased by our senses. Among the so-called "five senses," olfactory perception takes an exceptional position in the neurological processing of sensory stimuli. The olfactory bulb has direct connections to the two brain areas that control emotions and memories: the amygdala and hippocampus. Interestingly the sense of sound, sight and touch do not pass through these brain areas, they are routed through the thalamus which is the reason why sound, sight and touch interrupt sleep. This makes smell an especially interesting modality to use in human-machine interaction during sleep as well as wake states because it is processed by the brain but does not disrupt the ongoing brain processes as easily. Scent has a hidden power in our behavior and the unconscious. Positive and negative emotions not only transfer between individuals through mimicry of vision and hearing but also through smell. Other studies show that stress and anxiety can be reduced with the use of essential oils. Recent findings found that a single night of olfactory aversive conditioning during sleep, significantly reduced cigarette-smoking behavior in the wakefulness state and persisted for several days. Such functional studies continue to remain in the realms of research laboratories. The main aim of Essence was to fabricate a technology that people could use in their daily life, without the need for medical assistance nor burdensome devices. In our paper we describe the design and implementation of the prototype and describe potential applications for HCI. While scent has been widely explored in Psychology, Neuroscience, Chemistry and Art, the olfactory system has been less appreciated in the world of personal technologies. Current personal, wearable devices that promote wellbeing, such as fitness and sleep trackers, mostly make use of visual, auditory and the haptic stimuli. The HCI research community has formerly looked into some of the challenges and possibilities for smell based technology. Most recent HCI research andproduct development efforts have focused on enabling scent to become part of digital communications. Most systems use off the shelf aromas in their prototypes, focusing research efforts on the device itself. 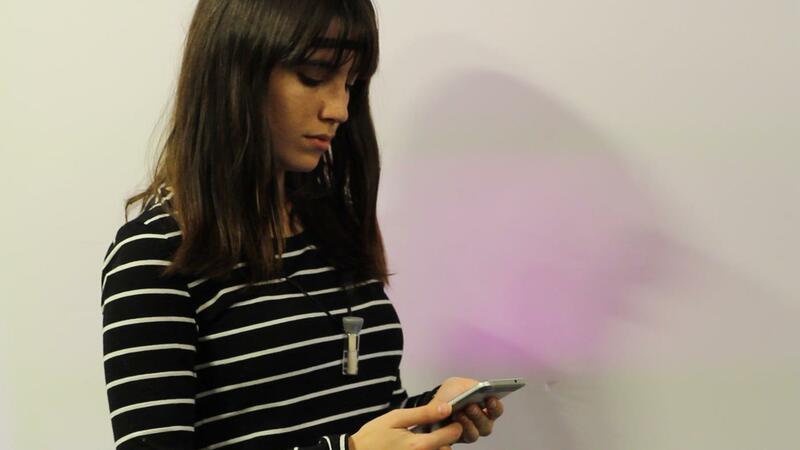 Essence is a fashionable, wirelessly controlled olfactory necklace. It can be used in everyday situations with automated control of the device based on contextual and physiological user data. 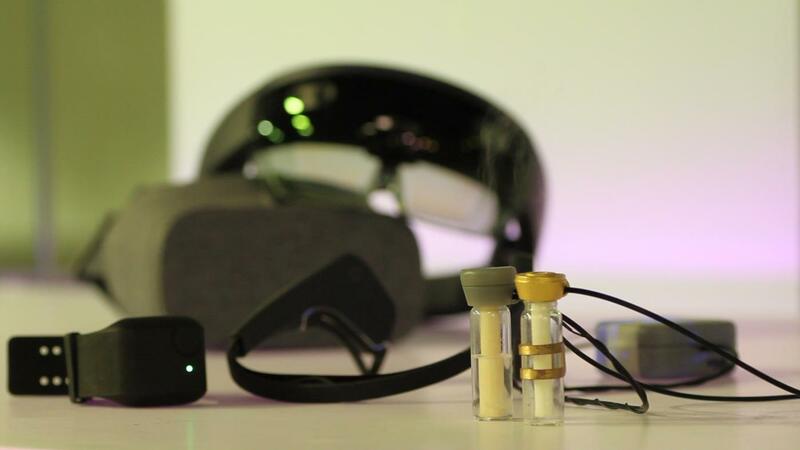 We propose Essence, a wearable olfactory display that was designed to be lightweight, fashionable and comfortable enough for people to be used in daily life. The main contributions that are distinct from previous work are the design of a fashionable olfactory necklace that is wirelessly-controlled and can be used in every-day life situations as well as the automated control of that device based on contextual and physiological data of the user. We also propose a set of novel applications for this type of technology that make use of biometric and contextual information in order to intervene with scent in particular instances.